We have marvelled at the exploits of Jessica Watson, who has just arrived home after seven months circumnavigating the world non-stop and by herself in her small yacht—so vividly and courageously living her dream. I’m not sure if she imagined the media scrum that would follow her every time she took a walk down the beach! We are also impressed that such a young per-son should be so audacious as to imagine herself at the centre of her accomplishment. So often we dream of the good things of life dependent on the actions of others (like winning the lottery) rather than on our own efforts. 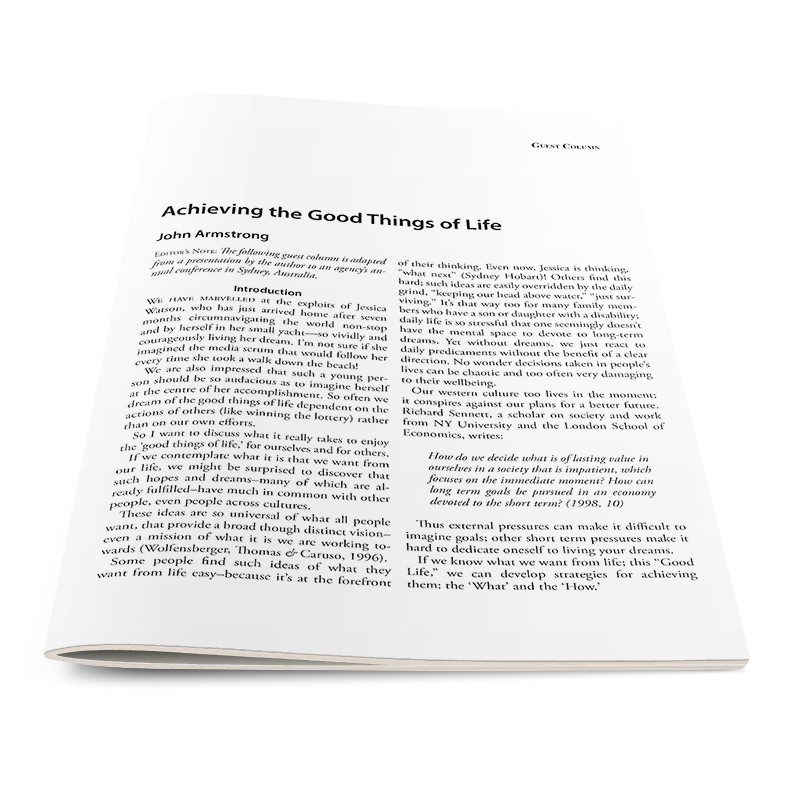 So I want to discuss what it really takes to enjoy the ‘good things of life,’ for ourselves and for others. If we contemplate what it is that we want from our life, we might be surprised to discover that such hopes and dreams–many of which are al-ready fulfilled–have much in common with other people, even people across cultures. These ideas are so universal of what all people want, that provide a broad though distinct vision–even a mission of what it is we are working to-wards (Wolfensberger, Thomas & Caruso, 1996). Some people find such ideas of what they want from life easy–because it’s at the forefront of their thinking. Even now, Jessica is thinking, “what next” (Sydney Hobart)! Others find this hard; such ideas are easily overridden by the daily grind, “keeping our head above water,” “just sur-viving.” It’s that way too for many family mem-bers who have a son or daughter with a disability; daily life is so stressful that one seemingly doesn’t have the mental space to devote to long-term dreams. Yet without dreams, we just react to daily predicaments without the benefit of a clear direction. No wonder decisions taken in people’s lives can be chaotic and too often very damaging to their wellbeing. Thus external pressures can make it difficult to imagine goals; other short term pressures make it hard to dedicate oneself to living your dreams. You usually develop and articulate goals, even to yourself, and then you find a context where these goals can be achieved: work, university/study, community groups and associations, and relation-ships of every kind. In other words, you craft some roles for yourself. The people you support will re-quire significant assistance to achieve such roles. Some of these roles are formal and structured, like obtaining a degree; other dreams are more dependent on the strength and commitment within a relationship, like being married and having children. In either case, success in the good things of life is dependent on the presence of others: some who do things for you, others who do things with you and some who just believe in you, encourage you and offer you love and affection. Has this list changed for you at all? Have your dreams changed since you were a teenager? Do you think Jessica’s list of ‘to do’s’ will change and develop? It shows that our vision for a better life for people must also adjust with time, with mastery and changed values and priorities that they have in their life. Not everyone you know aids your dreams; some people want to cut you down and promote responses against your interest. They become jealous when they see someone close to them excel. Have you ever met people like that? Sometimes you have to cut those people loose and begin to surround yourself with people who can share your dreams. Some dreams are shared with others and can benefit from the collective energy a common dream creates. Imagine the power of a dream that everyone shares? Clearly though, the good things of life can’t be achieved in the context of a ‘managed life’ where at best only basic needs can be met. The good things of life have always occurred in the ‘shared space,’ where flourishing and thriving is free to take place. What about the people you support–what are the implications of the good things in life for them? One is that people will need more assistance in dis-covering and shaping the roles they can occupy.